Usually players will get to know several popular concepts and tactics, but the problem is not knowing those things clearly! That’s where I have decided to dedicate my work for chess lovers who struggles to improve themselves. In this book I have explained all the little concepts and its types clearly. I have made this book completely reader friendly and without any coach you can manage to understand everything and will be able to teach someone else too! I have given all the necessary concepts precisely for easy understanding and to easily cover the book. I have illustrated various tactics with suitable examples, in the end of this book I have given some puzzles with detailed solution and player’s thinking process. I have also instructed how a player should think while playing chess and how to calculate with logical reasoning. I have made an assumption that the player to whom this book is dedicated is not a beginner and the player knows all the basic movements in chess. At the end of this book you’ll be able to look at a chess position at a different dimension and whole new level! I have classified players into four different categories namely 1. Beginners, 2. Intermediates, 3. Advanced, 4. Expert. The person who knows basic movements, tactics and will be able to deliver checkmate but struggles to get a material advantage and sometimes loses even after getting material advantage are classified as intermediates! And this book is absolutely for them. Some of the key concepts maybe in advanced level and intermediates will be able to understand those things to get to the next level. I strongly recommend you to read all the theories in this book and understand it and rectify your misconceptions! And then try to solve problems to get maximum benefit! 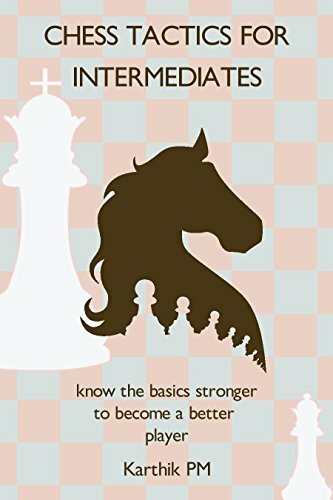 This is the Kindle version of Chess Tactics For Intermediates: Know the basics stronger to become a better player! that you can also download and read on your computer and mobile phone. Kindle books are DRM protected and therefore, unlike ebooks that are in PDF or ePUB format, you cannot read this ebook without the official Kindle apps.